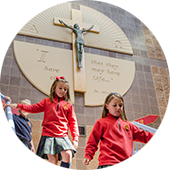 At STM Catholic, we believe that every stage in a student’s development represents an important experience in its own right, not just a stepping stone to the next level. We see all our students as potential leaders who, when challenged to become involved, can make a difference in our school community and the larger communities in which we live. To nurture spiritual growth, students active participation in the liturgical and spiritual life of the Faith and Parish. Additionally, to help students discover and engage their special gifts and talents outside the classroom, we provide a range of opportunities for involvement in athletics, the arts, community service, and extra-curricular activities. But, most importantly, we want our students to fully experience the joy, security, and self-awareness that come from interacting with others in a nurturing community environment. In other words, we want them to truly enjoy their time at STM Catholic, and go out into the community to be Disciples of Christ.